1.Come up with an idea. eBooks are no different from any other type of book except in their medium of publication, so the most important first step to writing one is to decide on, and develop, an idea for one. The basic way to do this is to sit down and write a brief phrase or sentence that encapsulates the information you’d like to put in your book. Once you have that, you can build on it to create a finished product. 2.Expand your idea. Start with the basic idea you wrote down, and think about different aspects of it. It may be helpful for you to draw a web of concepts to do this. For example, let’s say you wanted to write a book about how to sell real estate for beginners. You could write down things like “licenses and fees,” “selling techniques,” and “cost vs. expected returns.” Connect specifics that are related to each of them, and so on, until you have enough detail to see the structure of the words in your head. 3.Organize details. After unpacking and expanding your core idea, you should have a lot of information about your basic topic written down. Rearrange and organize it in a vertical outline until it makes sense to you and matches the way you’d like your book to flow. Think in terms of what your audience will need to know first, and put basics at the beginning. Once those have been covered, more advanced concepts can follow without losing the reader. 4.Write the book. Don’t worry about a title, table of contents, or any of the other stylistic elements of the book yet. Just sit down and start writing it. You may find it’s easier to “start in the middle” by writing a chapter of your choice first; you may prefer to start at the very beginning and write straight through. Just remember that you don’t have to pick one method and stick with it. Use whatever techniques you need to to complete the book. 5.Review and rewrite. Once your book is finished, let it sit for a week or so, and then come back to it with a critical eye. Look at the order of the chapters and sections first. Do they make sense to you? Often, you’ll find that some pieces seem to make more sense in a different spot than where you’d originally placed them. After you’re satisfied with the order of the book, read each chapter in order and edit and revise it. •Like writing, editing takes time – not as much time, but still a significant amount. Pace yourself by editing a certain number of words or chapters each day. 6.Add the details. Once the body of your book looks solid, it’s time to add a title, and any front or end material (such as an introduction or a bibliography) you’d like to add. Titles usually reveal themselves during the writing of the book; when in doubt, a plainspoken title (such as “How to Sell Real Estate”) is usually a safe choice. 7.Add a cover. Like physical books, a major marketing tool for any eBook is its cover. Even though it’s only a virtual cover, it’s what potential buyers notice first. Consider springing for a professionally-designed cover, or go it alone if you think you can make something that looks good and will attract sales. Just be sure to get permission before you use any copyrighted images. 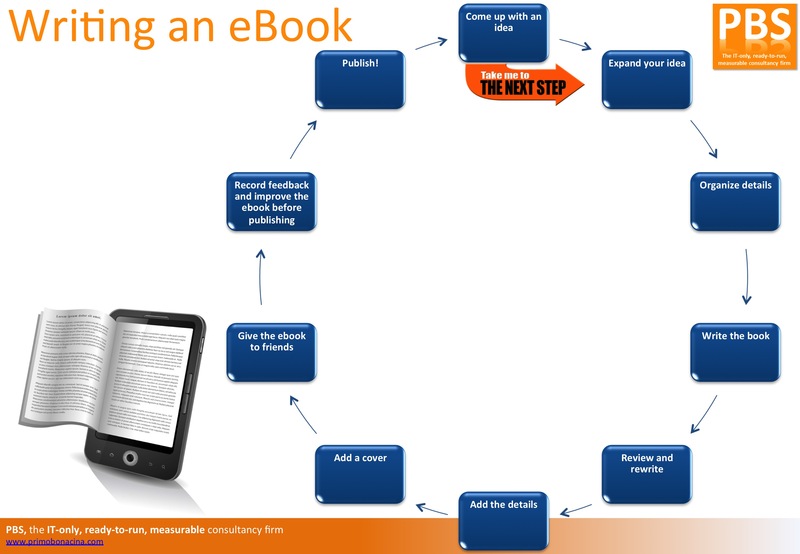 9.Record feedback and improve the ebook before publishing. Factor in all of the responses and try to address each of the issues that surfaced. Don’t be afraid to stir everything into the mix and redo the entire ebook from top to bottom. The likely result will be a marked improvement on what you created alone. If not, you can always retool and back up to the previous draft. Just contact us and we will make it happen for you!